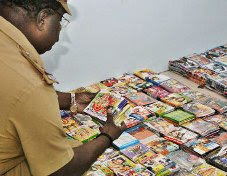 A police official inspecting the pirated compact discs in the city on Friday. The Coimbatore City Police on Friday arrested Abbas, a wholesale merchant, at Gandhipuram for selling pirated CDs numbering around 10,000 of latest Tamil, Hindi, English films and pornographic films besides audio CDs. Following circulation of such CDs, the Deputy Commissioner of Police (Law and Order), S. Rajendran constituted special teams led by Assistant Commissioner of Police, Sundaravadivelu. The teams led by Inspector of Police, V. Thangadurai during a raid found Abbas copying movies on CDs and selling them on wholesale.